A 1953 Austin Healey that raced in the New Zealand Grand Prix will make its show debut at Race Retro on 26th to 28th February, the first time it has been on public display anywhere in the world. The Healey 100/4 BN1, chassis no 145426, will be on display at Stoneleigh Park as one of three works cars that were sent to take part in the inaugural New Zealand Grand Prix on 9th January 1954. This Healey is an incredibly rare survivor of the era of racing when sports cars would compete against single-seaters; on the starting grid at the Ardmore Circuit was Jack Brabham's Cooper-Bristol MkII, a works-entered supercharged BRM V16, a pre-war Alfa Romeo Monza and various locally built specials. Only 14 cars were able to endure the 200-mile event, but all of the factory Austin-Healeys completed the 100 laps. 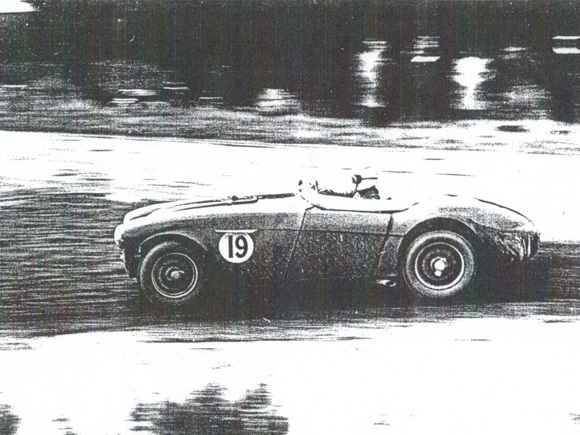 Keith Roper drove this 100/4 to 13th place beating Peter Whitehead's Ferrari 125 in the process. Roper next took the wheel of the Healey at the C W F Hamilton Trophy Race at Mairehau on 20th February 1954 where he achieved third place. The 100/4's final New Zealand event was the Havelock race meeting where the Healey recorded a record speed of 100mph in the flying quarter-mile event; the only other car to do so was a Jaguar XK120. Car no.145426 was sold in October 1954 and after passing through various owners, was placed into storage in 1971 where it remained for the next 24 years. Restoration commenced in 2005, and the 100/4 returned to the UK in 2014. Today the Carmine Red 100/4 looks in every detail the way it did when it left the factory in October 1953, with an original chassis, body and engine and 16-inch racing wheels. Sam Thomas Racing has recently prepared the Healey to compete in Historical Events and throughout 2016, it will be taking part in race meetings at the highest level including the Monaco Grand Prix.